You might have seen a recent post here on the blog that shared the importance of an extended wrist in fine motor activities. If you check out that post, you'll see why it's important for kids to position their wrist in a functional position. Today, I'm adding a simple fine motor activity for improving an extended wrist. This is a low-prep busy bag type of activity that kids can play with at home or at the OT clinic while building fine motor skills needed for tasks like handwriting, scissor use, clothing management, tool use (like spoons, knives, and forks), and so much more. For this activity, you'll need a colander. We used a plastic one that is as bright as it is perfect for rinsing garden lettuce. I love that this one has one curved handle that makes using it for fine motor activities like this one perfect for developing bilateral coordination. Kids can hold onto the curved handle while doing this easy fine motor activity. 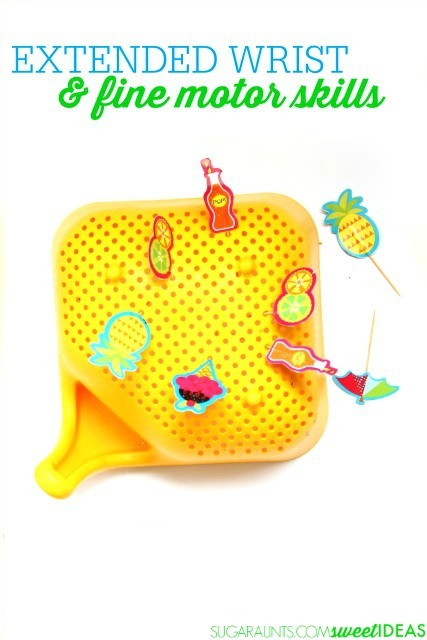 We also used summer themed party toothpicks similar to these that we've had in our party supplies forever. I'm really not even sure where these toothpicks came from, but it has to be true that everyone needs a pineapple party toothpick in their life, right?? I showed my preschooler and toddler how to poke the toothpicks into the overturned colander. As easy as that, our activity was on it's way. Super simple activities make moms and kids happy. Poking the toothpicks into the holes of the overturned colander allows the wrist to be in an extended position while the fingers are positioned in a tripod or pincer grasp as they hold the toothpick. Be sure to position the colander in an effective place. If the child is on the floor they may ulnarly deviate (bend the wrist toward their pinkie finger) or flex the wrist. Love this idea? Share it on Facebook! 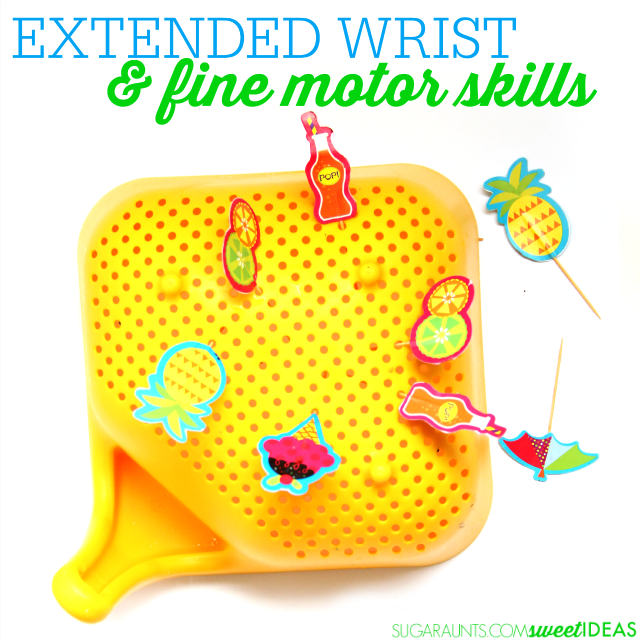 What are your favorite simple ways to work on fine motor skills?